First Nations leaders are punishing a coach and player for their part in a violent hockey game in Winnipeg. The Southeast Tribal Council has promised to suspend some individuals who were involved in a brawl during the annual Southeast Aboriginal Tournament at the Southdale Community Centre in February. A Winnipeg couple have a date to appeal their three-year ban from their child’s hockey games. A 25-year-old Manitoba junior hockey team that has churned out more than one NHL player is now in danger of folding. The appeal date for a Winnipeg couple banned from attending their eight-year-old son’s hockey games has been set for April 16. 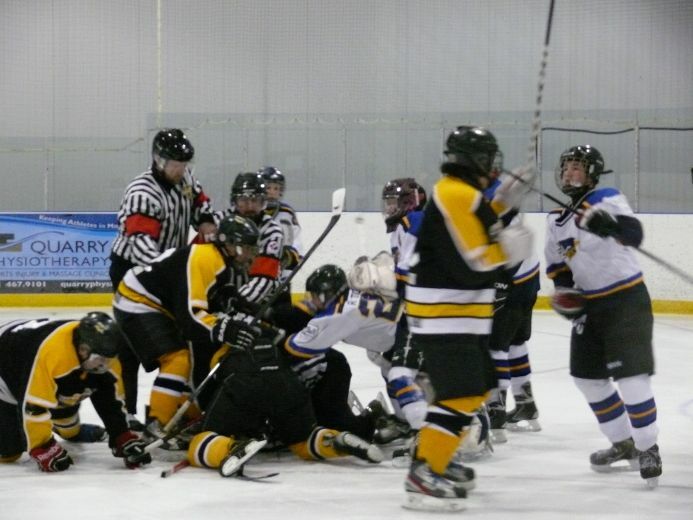 Some of the young Lake Manitoba hockey players caught up in a brawl on the ice during a game last weekend said they were being treated unfairly. A Winnipeg mother and father have been been banned from watching their eight-year-old son play hockey for three years after they got into a fist fight with the opposing team’s coaches during a kids tournament in Fargo, N.D., earlier this year. One of the coaches of a minor-league hockey team in Stonewall, Man., said he couldn’t believe it when a fight erupted during a game on Sunday, with RCMP having to be called in to break it up. Children’s hockey programs are winding down for the season, but the lucrative business of unregulated spring teams is just kicking off — sparking debate about whether kids should be playing year-round, and if the pricey leagues are worth it. WINNIPEG – A Winnipeg hockey player has won Internet fame with his rendition – in full goalie gear – of a popular southern dance called The Wobble. Now the Columbus Cottonmouths, his Georgia hockey team, is marketing the goalie's dancing prowess. Michael Remis examines the lack of on-ice success the Winnipeg Jets have had on bobblehead nights.